No other single model has ever possessed a more enduring vision of custom than the 1949-1951 Mercury. Wide whites, chopped top, fenders skirts and flames shooting out the pipes are the calling card of a classis lead sled Merc. There is another requirement of owning a lead-sled, frenched headlights. 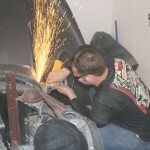 Frenching the headlights has been a mainstay of the rodding world since the beginning. 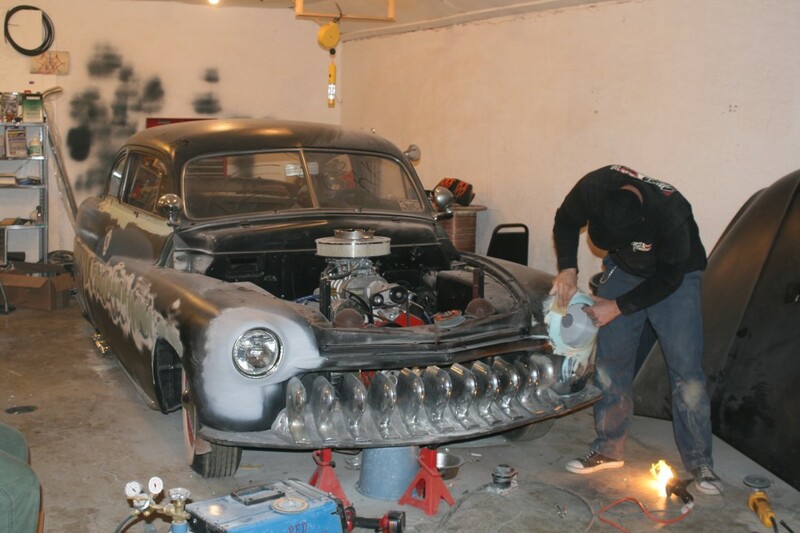 In the past, setting the headlights back in the fenders required a lot of custom work, shaping sheet metal, careful measuring, and required specialized tools to get the job done, leaving novice builders out of the loop. Then a few enterprising people started making kits that simplified the frenching process. Not only do these kits take out the guesswork, the result is finished off with shiny trim that sparkles. 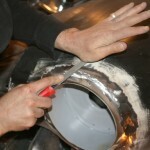 Installing one of these kits is quite easy, requiring very few tools and can be completed in a couple of hours. The best part about these frenching kits is that just about any builder to complete. RPPG, formerly Good Times Productions, manufacturers several frenching kits, including headlights, antennas, tag and several versions of taillights. 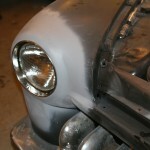 We took a set of “Custom Beams”, the 7” lamp complete French kit and installed them on a 1951 Mercury. The total job took less than 2 hours and only required a wire-feed welder, grinder, sandpaper and some rattle can primer. This is a seriously easy project that just about any gearhead can do, and it only costs about $250 bucks. 1. The RPPG Custom Beams kit comes with the buckets, headlight-mounting rings and a stainless steel trim ring. The buckets come primered and ready to weld in. 2. 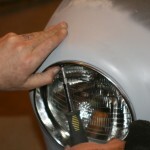 Our 51 Merc had already been hacked up to fit some Buick headlights, so we did not need to trim the opening. Had this car been stock, the hole would have been trimmed with a jigsaw. 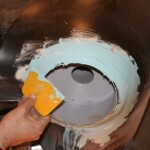 The area around the hole was cleared of all paint and body filler with a grinder to prep it for welding. 3. The bucket was held in place, adjusting it to fit the contours as best it could. The buckets fit perfectly with the roll of the fender. 4. 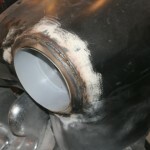 The bucket was tack welded in a few spots to keep it in place, the entire ring was stitch welded. 5. 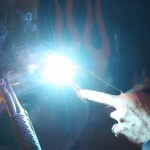 Each stitch weld was about an inch long, skip 1 inch, another stitch and so on. After one revolution, the skipped sections were stitched until the entire circumference of the bucket was welded up. 6. 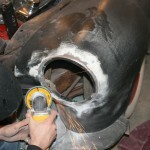 Using an angle grinder, we ground the welds smooth. 7. 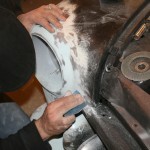 Once ground down, the metal was further shaped with a file to smooth the contours. 8. 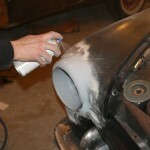 A coat of body filler was added to finish the job. 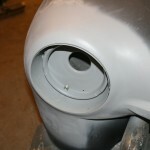 Don’t worry about working the filler smooth yet, leave it a little thick so it can be sanded smooth with less low spots, which require more applications. 9. 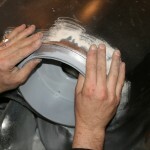 Next, we sanded the cured filler to perfection using increasingly finer grit paper. We start with 35, then 80, then 150 then 220. 10. After wiping the area with some paint thinner to clean it, a nice coat of rattle can self-etching primer from Eastwood was sprayed on. This is just to protect the metal while the car is being built, a real primer job will be done when the car is completed. 11. 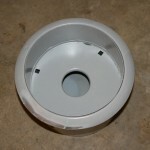 The headlamp-mounting ring was installed in the bucket. 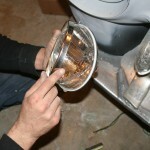 Note the small spring at the bottom of the bucket, this is for adjusting the aim of the light. See, just like factory. 12. The supplied headlamp trim ring simply slides over the 7” lamp. 13. Then the light was plugged in. 14. 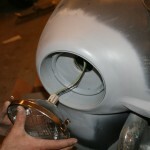 The headlamp was screwed in and the stainless steel trim bezel was mounted using two supplies stainless steel screws. 15. All done, the frenched lights really make a difference in the look of the front end. Any rod can benefit from the frenched beam look, you just need a couple of hours and a kit from RPPG. 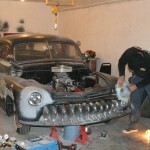 Have a 1946 Merc coupe RatRod That we have lowered and in the process of installing a 383 Stroker engine. Shaving handles had to fabricate the front grill area because somebody put a ford front end on it before I got it. I like the look of the French headlights and would greatly improve the looks.